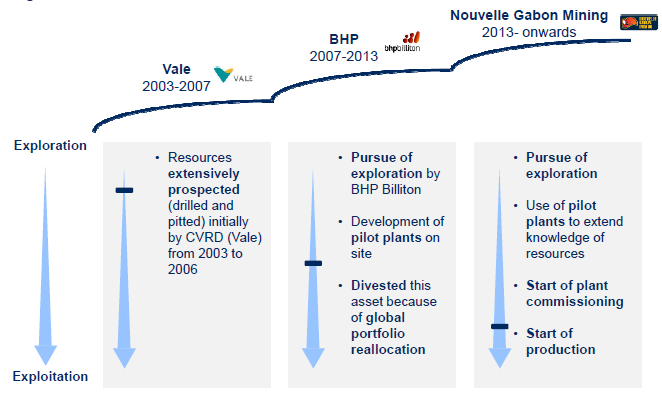 Identified in the early 2000s, the mineral deposits of the region of Franceville, were the subject of several studies and drilling campaigns in the following years by our predecessors; first CVRD (Vale) between 2003 and 2006, then BHP Billiton from 2007 to 2013. In 2007 and 2008, BHP Billiton obtained four (4) manganese exploration licenses. Nouvelle Gabon Mining acquired the rights for these permits at the end of 2013 and built its first manganese processing plant (Phase 1 Project) which began production in January 2017. At the same time, studies are being conducted for Phase 2 of the project, namely; the construction of a new mill of 1.4 million tons of enriched ore per year and, further down the line, a ferromanganese plant.